Trombone Shorty & Orleans Avenue exploded onto the stage at Jazz Cafe with their custom fusion of rock, funk, jazz, hip-hop and soul. Could this be jazz that appeals to the masses? I went to find out. The claim that Trombone Shorty has coined a new a genre of music, ‘Supafunkrock', in order to describe his signature sound may be quite a radical one. But he is clearly on to a good thing and has successfully fused an array of musical influences to create a very individual sound. His popularity was evident from a near sellout at the Jazz Cafe, the fans cheering and hollering. It’s led him to relatively starry international acclaim, previously touring with his idol Lenny Kravitz, and recently releasing a new album "Backatown", the title deriving from the locals’ term for the area of New Orleans that includes the Tremé, the neighborhood where Troy was born and raised. He will be appearing in the HBO TV series Treme, so his visibility will be increasing. 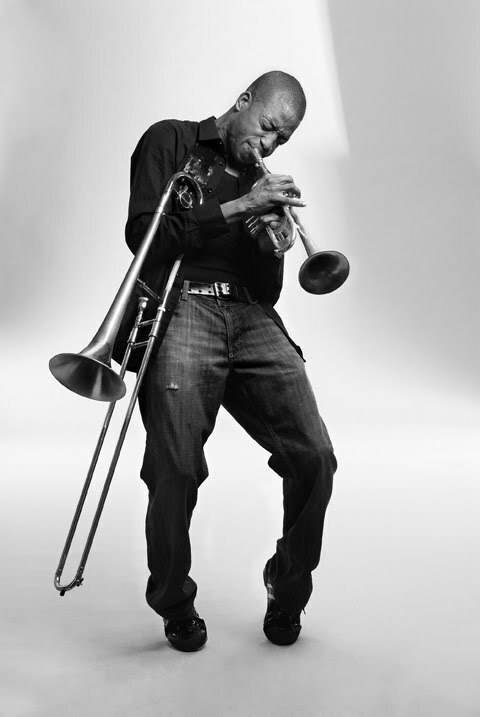 Troy "Trombone Shorty" Andrews (who got his name at four years old when his older brother saw him marching in a street parade with a trombone twice his size) is backed by an energetic band of fellow young guns. Orleans Avenue comprises of Tim Mc Fatter on tenor saxophone, Pete "Freaky Pete" Murano on guitar, Michael "Bass" Ballard on bass guitar and Joey "In And Out" Peebles on drums. The band's hot mix of New Orleans style horn riffs, choppy rock power chords and funky rhythm section was matched by Shorty’s showmanship and energy on stage. The intensity was persistent, and the crowd clearly loved the set menu of funky grooves, but the music didn’t leave much room for musical interplay. The closest thing was Shorty’s string of complex hand gestures to the rhythm section which cued precise unison hits, spurring on another of Tim Mc Fatter’s impressive screaming sax solos. Shorty is clearly a virtuoso. Indeed, I overheard someone say “Is there anything he can’t do?” Whether on trumpet, trombone or vocals, he wowed the crowd using fast phrases, circular breathing, rapid-fire articulation, screaming high notes and extravagant trombone slides. A particular highlight was the moment when Shorty left the flamboyant fusion behind and really showed the audience his New Orleans roots with an "Old Skool" trumpet intro. Intricate phrasing, Armstrong style half valve "whinny’s" and wide vibrato - this was refreshing to hear, but it didn’t last long, as the band promptly broke into a rendition of Marvin Gaye’s 1973 Motown hit "Let’s Get It On". After a tirelessly vivacious set of original music and popular classics, the night ended with a modern take of "Oh When The Saints". A last chance to wow the crowd didn't get missed as the band broke into the classic "Everybody Needs Somebody" with trademark choreographed Blues Brothers style dancing. A very happy crowd left the Jazz Cafe saying things like “He’s amazing." An enjoyable night of showmanship, virtuosity and energy. Saw this band as the support act to Jeff Beck. They were fantastic!! Brilliant ! !